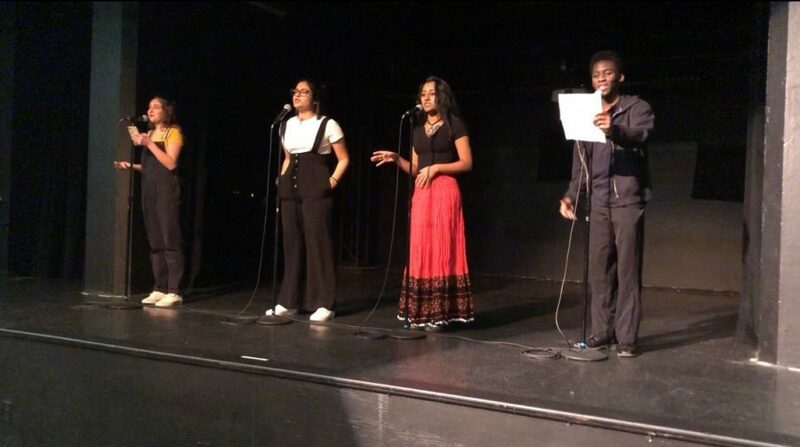 From left to right: Ella Woods, sophomore; Sarah Abbas, sophomore; Megha Sanjay, senior; and Ahmed Barrow, senior participate at the 2019 Verbaquake Poetry Slam. The team won the championship, and Abbas went on to also win a solo award. Sarah Abbas, sophomore, placed first at a poetry slam competition. Abbas's win qualifies her for Brave New Voices, Missouri's slam poetry team. Last week, Sarah Abbas, sophomore, placed first in individual finals for slam poetry allowing her to qualify for the Brave New Voices, Missouri’s slam poetry team. The slam team has meetings every Thursday with extra meetings right before competition to prepare. While written poetry requires special formatting and later analysis for readers to find the true meaning, slam poetry requires more performance and clarity in the poems. “Judges really look at how well written the poem is, the projection and the passion the poet has with their topic,” Abbas said. 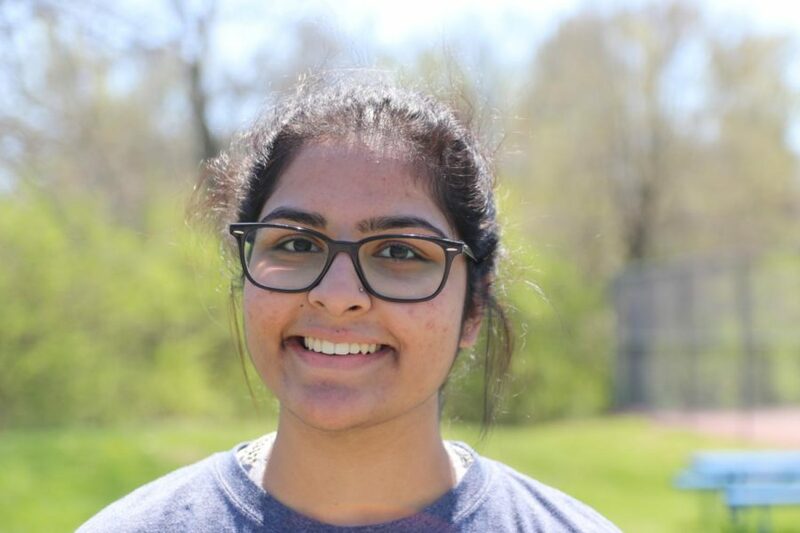 As a Muslim Pakistani teen she has a lot of topics really personal to her that haven’t been heard before, and she incorporates Urdu to add her personal voice to the poems. Ella Woods, sophomore, wrote a group poem with Abbas this past year and noticed the passion she had with each and every one of her poems. “Not only does she perform really well and have well written poems, but she is so passionate about the poetry and all of the topics of her poems,” Woods said. Abbas competed four poems: a group one with Woods about balancing being half American and half Pakistani and Iranian, two others about being Muslim, and one last one about her father. Shelly Justin, founder of poetry club, also was inspired by Abbas and proud of her win. Excited, joyous, but not entirely surprised. This is how members of the MHS Poetry Slam team, Beauty and the Beats, felt after taking first place in the Grand Slam Team Finals hosted by UrbArts on March 2. Three members from the Poetry Slam team, senior Megha Sanjay and sophomores Sarah Abbas and Ella Woods, participated in the team finals. “There was some really tough competition, but also I was really confident in my team members because I know they are really talented, so I had good expectations for our group,” Abbas said. Each member of the team performed an individual poem as well as a group poem. The group poem ended up being the highest scoring poem of the night. Abbas said she loves both team and individual competitions, but said having the support of the team makes her feel safer. “It’s so much fun to watch everyone grow and perform, and when they perform and you can see their growth and see how much they’ve improved, that’s a really nice feeling,” Abbas said. In team finals, each performer is given a score for the poems they have performed, and these scores are added together to make the team score. The Grand Slam Team Finals, which Woods said was the equivalent of State for an athletics team, featured three rounds, with a member from each competing team performing each round. Woods is new to slam poetry this year. Woods said she was excited and surprised to learn they had taken first place, but said they deserved it for all the work they put in. “Obviously as you move up in the competition, the teams keep getting better and better, so it was exciting to know that we got first place,” Woods said. Shelly Justin, language arts teacher, said she had a good idea that they had taken first before it was even announced. It could have gone another way, but she said she wasn’t surprised MHS had won. To help the team prepare, Justin said she invited alumnus Zack Lesmeister, Class of 2018, to coach the students. Lesmeister was the 2017 Youth Poet Laureate and a member of the original competition team, which started two years ago when, on a whim, Justin signed her team up for the competition. The team has moved up a place each year, taking third place the first year, second place the second and first place in this the team’s third year of competing. The team will bring home a first place trophy engraved with the team name. In addition to taking first in the team finals, all three members of the team qualified for Individual Finals, which took place on March 8.